Avon Rubber designs, develops and manufactures product in the protection (70% of 2018 sales) and dairy (30%). Its major contracts are with national security organisations such as the US DoD. Over 70% of 2018 sales are from the US. Avon Rubber’s FY18 report demonstrates the success of the new business strategy, delivering growth across both divisions. The product portfolio has been updated and the company is winning contracts in new geographies. The company has also taken action to address its business structure and production footprint. We see continued opportunity for organic growth supported by selective bolt-on acquisitions. Note: *PBT and EPS are normalised, fully diluted and excluding amortisation of acquired intangibles, exceptional items and share-based payments. **Restated for AEF disposal. FY18 reported revenue of £165.5m (FY17 £159.2m), equated to 8.7% growth at constant currency. FY18 adjusted operating profit of £27.3m (FY17 £26.1m) reflected profitable growth in both divisions, up 11.8% on a constant currency basis, demonstrating momentum behind the business strategy. FY18 adjusted EPS of 77.1p (FY17 83.8p) was fractionally down at constant currency due to a lower tax provision release versus FY17. However, FY18 dividend of 16.02p (FY17 12.32p) reflected management’s confidence in the business going forward. Cash conversion was strong at 108.2% of EBITDA, supported by the contribution from AEF disposal for $9.25m. Avon has demonstrated success in winning orders on new programmes and geographies. The company expects to deliver growth through its three strategic priorities of growing the core, selective product development and value-enhancing acquisitions. 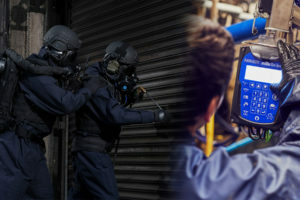 There is a growing requirement from global defence agencies to address chemical, biological, radiological and nuclear (CBRN) threats and Avon has developed its product portfolio to address this. Additionally, while the dairy market is not without challenges, Avon is offering technology globally to improve yields and enable farmers to operate more efficiently and profitably. Our DCF on a calculated WACC of 8.0% currently delivers a value of 1,532p, vs 1,499p previously. Our sum-of-the-parts valuation is shown as 1,878p. 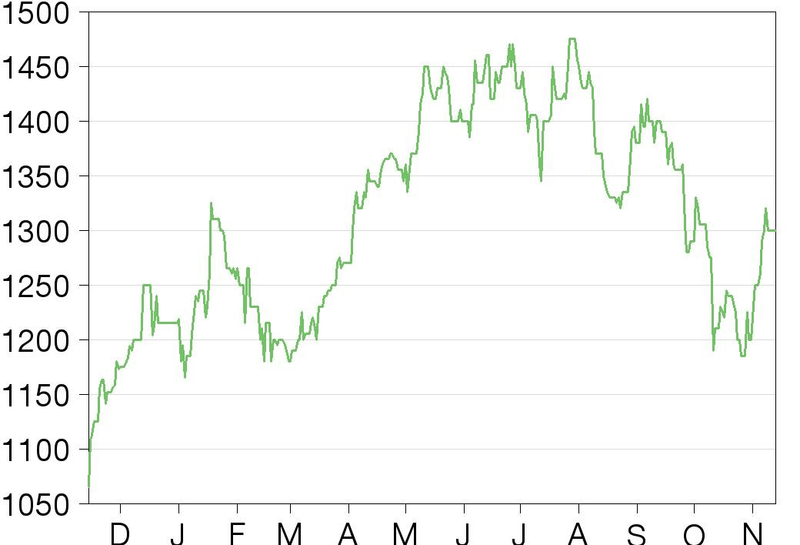 On our updated forecasts, Avon Rubber is currently trading on 16.4x FY19e P/E. This multiple looks undemanding versus the UK aerospace and defence peer group, which is deserved, given its exposure to the growing US defence budget environment. Avon’s position to address the heightened CBRN threat in the UK and overseas underpins the higher than average margin performance and future growth in our forecasts. Hence, we believe a valuation premium is justified. Reported FY18 orders of £173.3m (FY17 £166.0m restated) were ahead of reported FY18 revenues of £165.5m (FY17 £159.2m restated). This equated to 8.7% revenue growth at constant currency and against our estimate of £160.8m. Reported adjusted operating profit was £27.3m (FY17 £26.1m restated), up 11.8% at constant currency. FY18 adjusted EPS was 77.1p (FY17 83.8p) and the final dividend 10.68p gave a total dividend per share for FY18 16.02p (FY17 12.32p). Avon Protection reported FY18 revenue of £115.7m (FY17 £109.8m restated), up 10.6% at constant currency. Orders received of £124.6m (FY17 £116.0m restated) resulted in a book to bill of 1.08x. The division reported FY18 adjusted EBITDA of £26.6m (FY17 £26.8m restated), representing growth in constant currency of 5.3%. The adjusted EBITDA margin actually decreased by 140bp, reflecting product mix with higher M50 mask system volumes versus FY17. The Military division reported FY18 revenues of £66.1m (FY17 £64.2m), up 8.0% at constant currency. US Department of Defense revenues increased to £52.7m (FY17 £50.5m), reflecting higher M50 mask system deliveries plus higher aftermarket sales. The initial 10-year M50 contract concluded in July and the M50 order book for FY19 stands at 89,000 systems. The company is in discussions for a follow-on contract for the M50 mask systems. In addition, the company has invested in the M69 aircrew mask and M53A1 mask and powered air system. Closer to home, Avon has re-established its role with the UK Ministry of Defence through the General Service Mask contract. This contract has allowed Avon to demonstrate its technical capability and the company believes that this could drive further domestic contracts. Globally, Avon recognises the demand for defence agencies to address CBRN threats with its broad product portfolio. The Law Enforcement division reported FY18 revenues of £35.4m (FY17 £29.0m), up 28.1% at constant currency. The division benefited from higher sales of filters and spares, plus initial sales of the powered air range boosted the year-end progress. Looking forward, Avon believes that it will increase its market penetration into law enforcement agencies in the US and elsewhere. The Fire division reported FY18 revenues of £14.2m (FY17 £16.6m), down 10.0% at constant currency. As we have discussed before, the market has been challenged by delays in introducing the 2019 National Fire Protection Association (NFPA) standards, which, in turn, has delayed product purchases. Avon believes that these delays will start to be reversed from FY19, as it launches its Magnum Self-Contained Breathing Apparatus (SCBA) range in H219. Avon has also introduced the argus Mi-TEC E L camera to the US market and it is already NFPA-approved. Overall, while the fire market has had its challenges, Avon has addressed its strategy and product portfolio to deliver growth going forward. We believe Avon Protection has invested in its product portfolio to ensure it is well-placed to leverage growth in defence and law enforcement budgets globally. We believe that the delays experienced in the fire protection markets will reverse and support growth. Meanwhile, Avon has taken action to tidy up its business portfolio, with the sale of the Avon Engineered Fabrics business in FY18. In addition, the business has also relocated the West Palm Beach electronics assembly, acquired with the Hudstar deal in FY15, to the Cadillac site in Michigan, which is Avon’s main US manufacturing facility. In addition to a production assembly line in Kazakhstan, the company will continue to explore flexible production solutions to align with customer requirements. We also believe that the company will seek to bolster organic growth with selective bolt-on acquisitions. milkrite | InterPuls reported FY18 revenue of £49.8m (FY17 £49.4m), up 4.3% at constant currency. Orders received of £48.7m (FY17 £50.0m) resulted in a book to bill of 0.98x. The division reported FY18 adjusted EBITDA of £10.9m (FY17 £10.9m), representing growth at constant currency of 5.2% and a 20bp step-up in margin. Interface reported FY18 revenues of £35.6m (FY17 £35.9m), up 2.9% at constant currency. While sales in North America were weaker than expected in H118, there was a notable pick-up in H218, supported by the Merrick’s calf nurser product line acquisition. So although FY18 North American revenues declined by 1.7% at constant currency, H218 performance grew 3.9% on the same basis. FY18 revenue growth at constant currency in Europe was 7.2%, while liner revenue grew in Asia Pacific and Latin America by 8.2% and 11.5%, respectively. Going forward, the business will focus on expanding its dealer network and product innovation to drive growth. Precision, Control & Intelligence reported FY18 revenues of £9.0m (FY17 £9.0m), up 1.9% at constant currency. Growth was visible in Europe and the Middle East., We anticipate that the business will leverage the Interface platform in North America through the sales specialists it has already added. The business has also boosted its technical support capability. Farm Services reported FY18 revenues of £5.2m (FY17 £4.5m), up 19.8% at constant currency. Cluster Exchange is at the heart of the growth here, boosting cluster points from 35,000 (624,000 cows over 1,900 farms) in FY17 to 40,000 in FY18 (637,000 cows, over 2,100 farms). Growth has been visible in both North America and Europe. While the overall dairy market is not without its current challenges, Avon has innovated its product portfolio to ensure it is providing an attractive solution to the global market. The growth in Farm Services is continuing to build intelligence from usage data as well as adding greater revenue predictability. We believe the division will deliver organic growth while looking to bolster this through bolt-on acquisitions. The table below reflects our estimate revisions and introduce our FY20 estimates. Our cash-based capped DCF valuation is, in our view, a conservative basis for estimating cash flow values as it does not assume any growth in the terminal value. While we do normalise working capital to zero and capex to equal depreciation, it still eliminates some element of the potential tail value. The DCF on a calculated WACC of 8.0% currently delivers a value of 1,532p, previously 1,499p. Our sum-of-the-parts valuation is shown 1,878p. Taking an average of our DCF valuation and our sum-of-the-parts valuation gives a fair value price of 1,705p, which would imply a FY19e P/E of 21.7x. On our updated forecasts, Avon Rubber is currently trading on 16.4x FY19e P/E, which we feel is undemanding versus the UK aerospace and defence peer group. Avon’s position to address the heightened CBRN threat in the UK and overseas underpins the higher than average margin performance and future growth in our forecasts. Hence, we believe a valuation premium is justified. Copyright 2018 Edison Investment Research Limited. All rights reserved. This report has been commissioned by Avon Rubber and prepared and issued by Edison for publication globally. All information used in the publication of this report has been compiled from publicly available sources that are believed to be reliable, however we do not guarantee the accuracy or completeness of this report. Opinions contained in this report represent those of the research department of Edison at the time of publication. The securities described in the Investment Research may not be eligible for sale in all jurisdictions or to certain categories of investors. This research is issued in Australia by Edison Investment Research Pty Ltd (Corporate Authorised Representative (1252501) of Myonlineadvisers Pty Ltd (AFSL: 427484)) and any access to it, is intended only for "wholesale clients" within the meaning of the Corporations Act 2001 of Australia. The Investment Research is distributed in the United States by Edison US to major US institutional investors only. Edison US is registered as an investment adviser with the Securities and Exchange Commission. Edison US relies upon the "publishers' exclusion" from the definition of investment adviser under Section 202(a)(11) of the Investment Advisers Act of 1940 and corresponding state securities laws. As such, Edison does not offer or provide personalised advice. We publish information about companies in which we believe our readers may be interested and this information reflects our sincere opinions. The information that we provide or that is derived from our website is not intended to be, and should not be construed in any manner whatsoever as, personalised advice. Also, our website and the information provided by us should not be construed by any subscriber or prospective subscriber as Edison’s solicitation to effect, or attempt to effect, any transaction in a security. The research in this document is intended for New Zealand resident professional financial advisers or brokers (for use in their roles as financial advisers or brokers) and habitual investors who are “wholesale clients” for the purpose of the Financial Advisers Act 2008 (FAA) (as described in sections 5(c) (1)(a), (b) and (c) of the FAA). This is not a solicitation or inducement to buy, sell, subscribe, or underwrite any securities mentioned or in the topic of this document. This document is provided for information purposes only and should not be construed as an offer or solicitation for investment in any securities mentioned or in the topic of this document. A marketing communication under FCA Rules, this document has not been prepared in accordance with the legal requirements designed to promote the independence of investment research and is not subject to any prohibition on dealing ahead of the dissemination of investment research. Edison has a restrictive policy relating to personal dealing. Edison Group does not conduct any investment business and, accordingly, does not itself hold any positions in the securities mentioned in this report. However, the respective directors, officers, employees and contractors of Edison may have a position in any or related securities mentioned in this report. Edison or its affiliates may perform services or solicit business from any of the companies mentioned in this report. The value of securities mentioned in this report can fall as well as rise and are subject to large and sudden swings. In addition it may be difficult or not possible to buy, sell or obtain accurate information about the value of securities mentioned in this report. Past performance is not necessarily a guide to future performance. Forward-looking information or statements in this report contain information that is based on assumptions, forecasts of future results, estimates of amounts not yet determinable, and therefore involve known and unknown risks, uncertainties and other factors which may cause the actual results, performance or achievements of their subject matter to be materially different from current expectations. For the purpose of the FAA, the content of this report is of a general nature, is intended as a source of general information only and is not intended to constitute a recommendation or opinion in relation to acquiring or disposing (including refraining from acquiring or disposing) of securities. The distribution of this document is not a “personalised service” and, to the extent that it contains any financial advice, is intended only as a “class service” provided by Edison within the meaning of the FAA (ie without taking into account the particular financial situation or goals of any person). As such, it should not be relied upon in making an investment decision. To the maximum extent permitted by law, Edison, its affiliates and contractors, and their respective directors, officers and employees will not be liable for any loss or damage arising as a result of reliance being placed on any of the information contained in this report and do not guarantee the returns on investments in the products discussed in this publication. FTSE International Limited (“FTSE”) © FTSE 2018. “FTSE®” is a trade mark of the London Stock Exchange Group companies and is used by FTSE International Limited under license. All rights in the FTSE indices and/or FTSE ratings vest in FTSE and/or its licensors. Neither FTSE nor its licensors accept any liability for any errors or omissions in the FTSE indices and/or FTSE ratings or underlying data. No further distribution of FTSE Data is permitted without FTSE’s express written consent.